This is a Sponsored post written by me on behalf of Cooper Cheese for SocialSpark. All opinions are 100% mine. 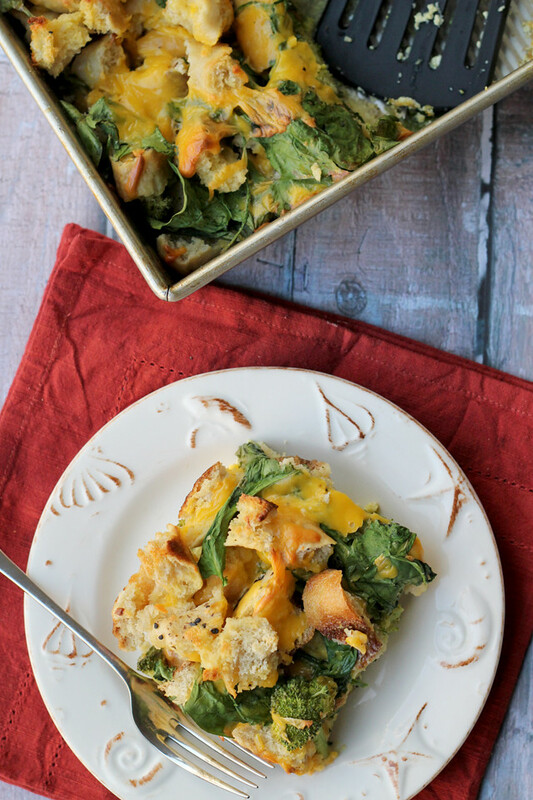 The classic bagel, egg, and cheese gets a veggie update in this holiday-worthy breakfast strata! How do you breakfast sandwich? That’s a real question. As well as a real verb. I Urban Dictionary’ed it in the future because we are going to breakfast sandwich our way into 2014 so.hard that it’s going to become an official thing. I can feel it. 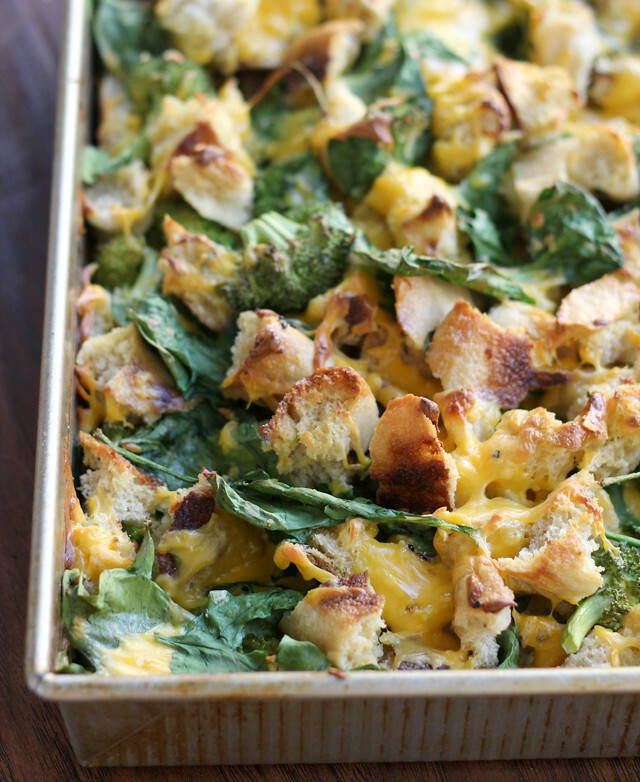 Except…we’re breakfast sandwiching in strata form. Holiday breakfasts growing up were all about the incredible edible egg. After presents were opened, my dad would turn into a short order chef – I was sunny side up, my brother was scrambled, my sister was too young to know what she wanted, my mom was probably too busy doing some last minute vacuuming, and if we were lucky he’d let us put slices of American cheese on top during the last minute of cooking so that it would get all melty and delicious. Now, I may have a serious (borderline fanatic) love of some of the more “pinkies up” cheeses, but if anyone tries to tell you there is a better cheese to stuff into an omelet or a grilled cheese than American…they are lying. And if Christmas fell on a weekend? There would be bagels and we would have breakfast sandwiches. And it would be heavenly. So when Cooper Deli sent me some of their American cheese varieties to try out (white! yellow! black pepper! ), I knew I had to breakfast sandwich it. For old time’s sake. This strata translates a little bit better to entertaining than the sandwich itself does, as it can be made ahead and in one pan. 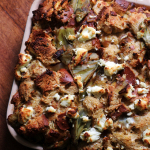 The bagels can be stale, the veggies can be pre-chopped, and all of the ingredients can be tossed together the night before and then baked off the next morning so that everyone can wake up to a cheesy winter wonderland. And if that’s not a Christmas miracle, it’s hard to say what is. Unbeknownst to me before this, Cooper deli cheese has been around since 1893! Its tried and true cheeses have definitely stood the test of time for good reason…they were super creamy and perfectly meltable. Just what you’d want in an American cheese. I used the yellow variety for this recipe but can’t wait to try out the other two! Be sure to check out Cooper Cheese on Facebook and follow @TheCooperCheese on Twitter! The classic bagel, egg, and cheese gets a veggie update in this holiday-worthy breakfast strata! Heat oven to 350. 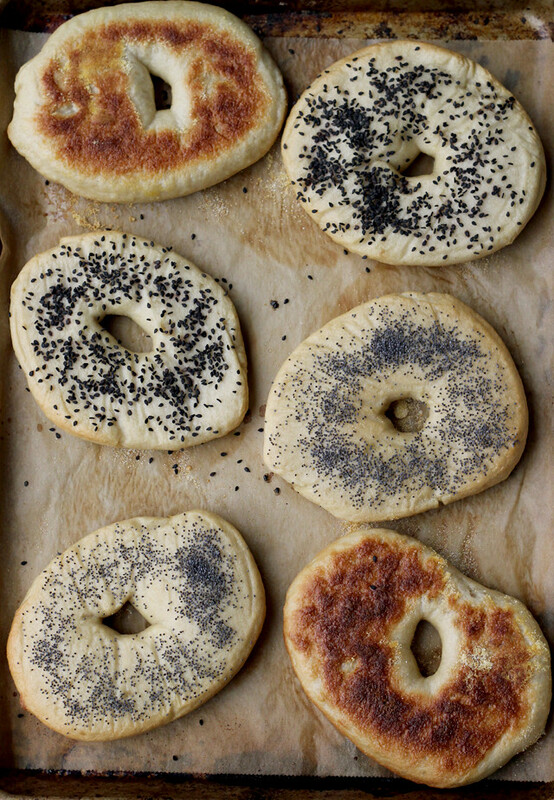 Place bagel chunks on a parchment-lined baking sheet in a single layer. Toast in the oven for 10 minutes. Let cool slightly while you prep remaining ingredients. 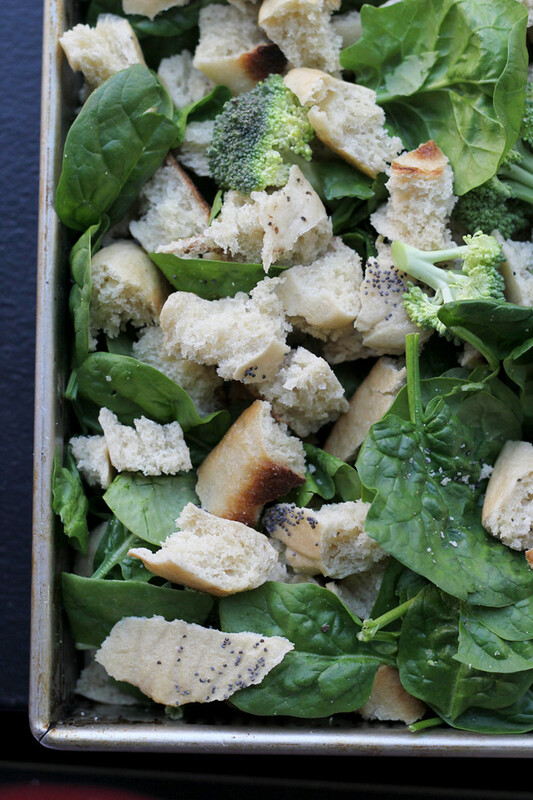 Toss the toasted bagels with the broccoli and spinach. Pour into a greased 9x13-inch pan. Sprinkle the grated cheese over the top. Bake for 40-50 minutes or until set. Let sit 10 minutes before serving. Sounds like a Christmas miracle that I’d like to experience at my house, too! 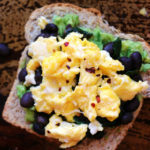 I was eating an egg breakfast sandwich with American cheese as I read this post. It’s like you talked to my stomach in advance. My mom ALWAYS makes strata on Christmas, pretty much for all the make ahead reasons you listed above, but it’s become just tradition now, even if we have no where else to be. We always called it “Christmas egg stuff” — not like stuffed eggs, but more like that stuff made out of eggs that no one knows the name of. This is such a cool idea!! I love this! This looks so amazing! 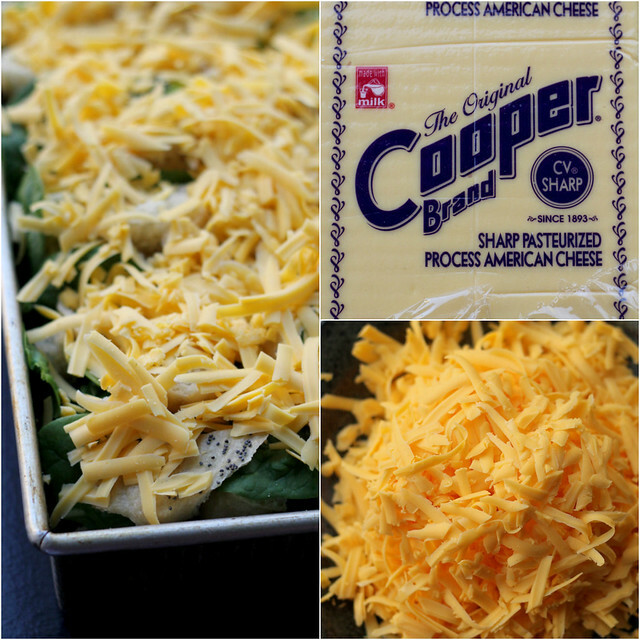 I need to find this Cooper Cheese! Also, I have to say I have stuffed Gouda cheese into my omelettes and it’s damn tasty. That and pepper jack and most recently goat cheese I’ve found are amazing too! Looks delicious!! 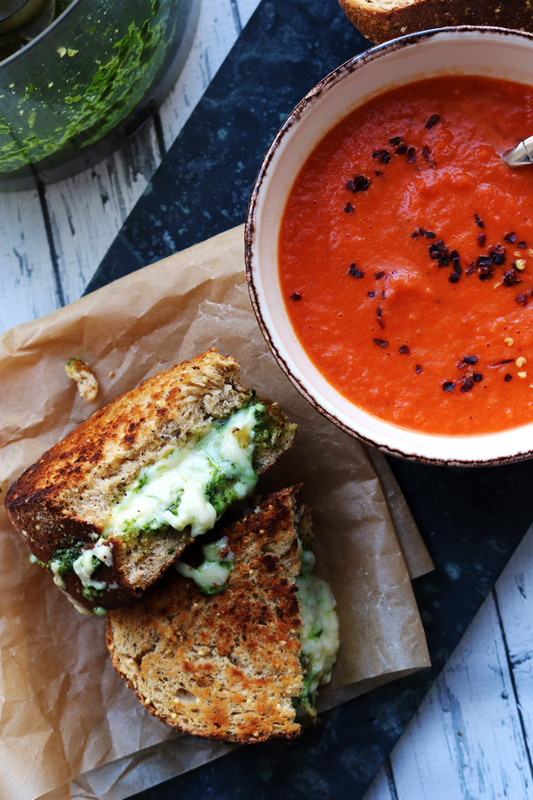 Cheese always makes things better! 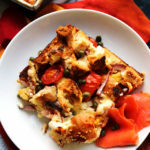 Fun easy breakfast casserole Joanne! I’ve never seen Cooper Cheese before…will have to keep my eyes open and see if I can spot it. all look amazing Joanne, and daugther always asked me bagels and yours look wonderful!! This would be such a cozy, delicious Christmas morning breakfast! Pure comfort in a casserole, Joanne. I love this recipe! A nourishing and comforting casserole, Joanne. Great for every meal. I love that you used bagel in this strata! 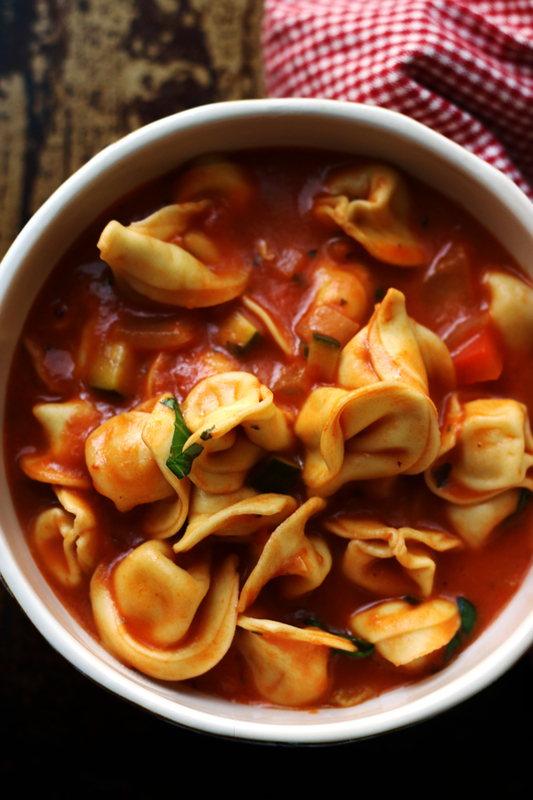 It looks delicious, comforting, and hearty. YUM. This looks fantastic! 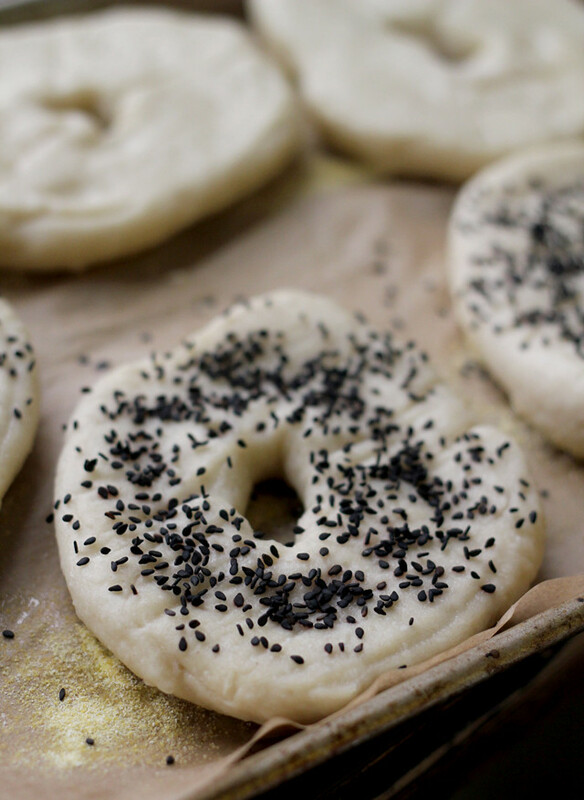 What a great bagel-ish option for those of us who don’t live in the land of amazing bagels. Nobody does a bagel like NYC so I’d be happy with sub-par bagels in this! This is the kind of breakfast i would love to wake up to on Christmas morning! I am seriously drooling right now. 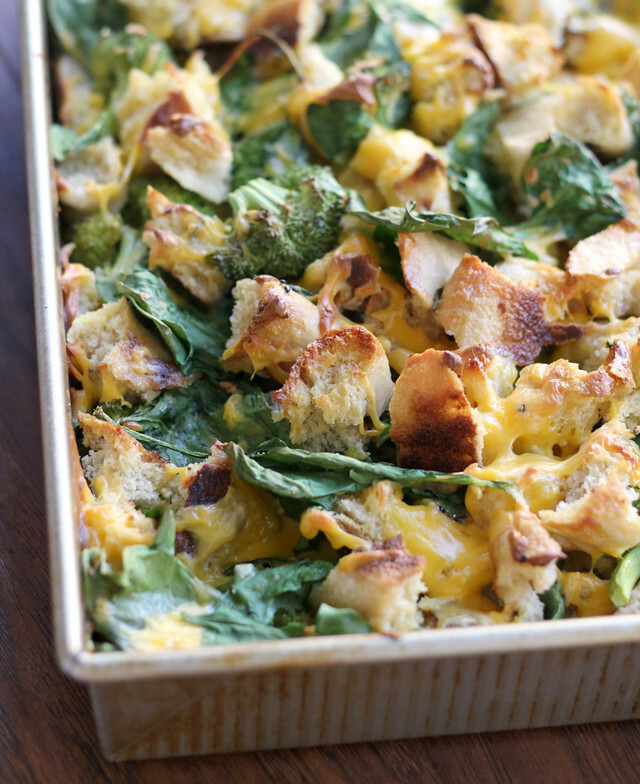 I think “breakfast strata” should become a part of my regular vocabulary (everyone’s, really), because this strata with cheese looks like a breakfast I could have over and over. I love the idea of you and your family having special holiday eggs. This cheese looks delicious! 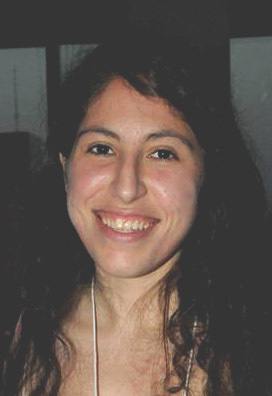 Hope you are enjoying your week, Joanne! This looks so delicious! Love the bagel pieces! I’m all about eggs any which way. We are usually way more in the breakfast burrito camp than the breakfast sandwich–but you know I love my bagels! This sounds like a perfect combination, and definitely a great way to feed a crowd on a festive morning. so you made your own bagels, and then this frittata? killer. bet it’d make a fantastic breakfast Christmas morning! The perfect excuse to buy those half off bagels at the end of the day (and besides breakfast sandwiches American cheese is the perfect cheese for grilled cheese). This looks DELICIOUS! I will have to pick up some Cooper Cheese and try for myself! 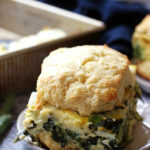 i never thought of a strata as a breakfast sandwich, but you’re right–it totally is! yum! That looks so good! Christmas morning worthy. We make a strata every Christmas, but BAGELS, I am stealing this! You are a smart little cookie! i don’t eat bagels very often, but i wouldn’t pass them up in this form. very creative! That last photo is really good marathon woman! I have to print this out for leftover veggies. I can’t say I’m a huge fan of American cheese, but you make it look so good here! AHH! Bagels and cheese! Two of my favorite things. 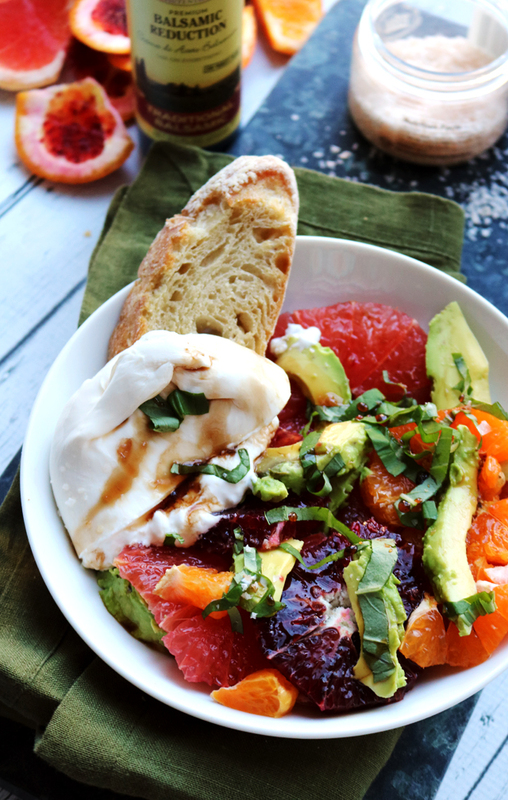 I wish I was having a holiday brunch because I would totally make this. Oh yummy yum yum, broccoli and spinach? Sign me up! Looks great! I know I’ve probably said it before about other dishes, but I take it all back. 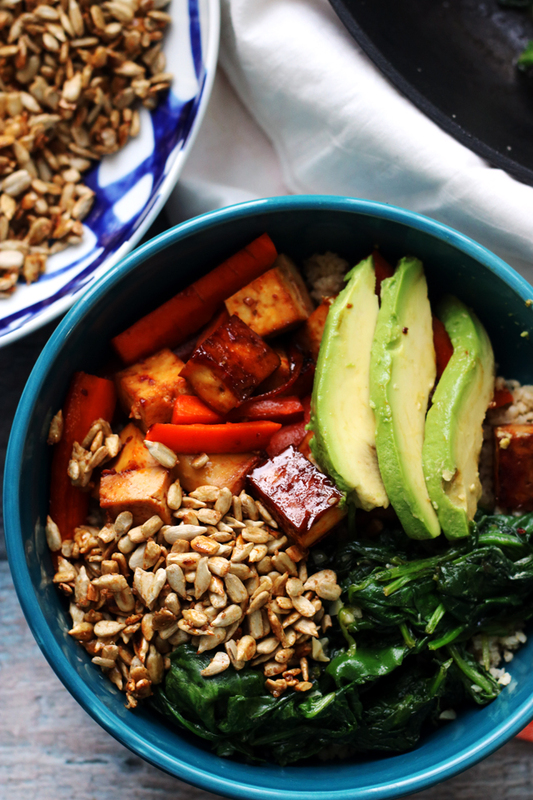 This is your most brilliant dish to date. I’d probably sub out the American cheese for some cheddar, but the idea holds up, and sounds really good, and doable. I’ve had a few breakfast stratas but this one sounds terrific with the bagels. I haven’t had them in a strata before…sounds great. Why oh why have I never thought to put bagels into my breakfast casseroles. This is pure and delicious genius, Joanne! We used to do Onions and Eggs. Not Eggs and Onions….no, Onions and Eggs. Which Paul thinks is gross. But what does he know? He can’t even make a grilled cheese without burning it. I’ll take some of this strata, please. Doesn’t need to be a holiday. Or the weekend. 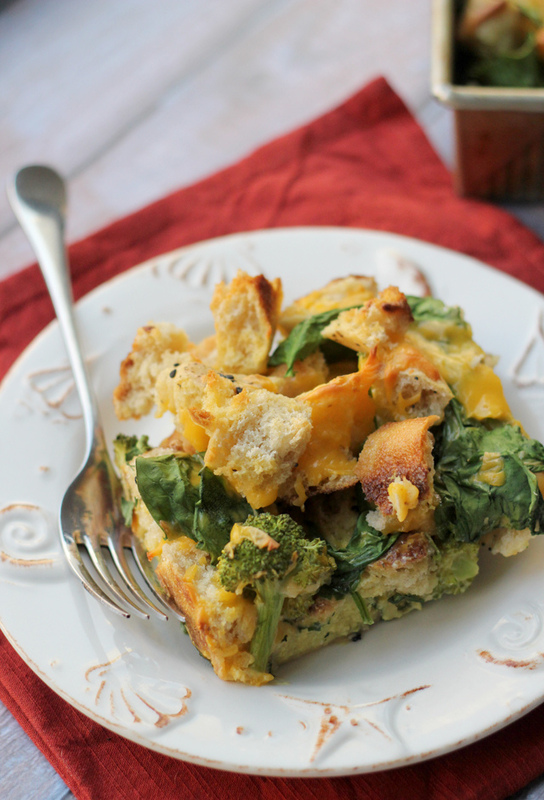 What a great way to eat veggies in a breakfast casserole! Love this idea Joanne! Happy Friday! This is beautiful, Joanne! The idea of using bagels is brilliant, and I also love the idea of getting veggies in early on Christmas morning…I’m definitely making this!! wow. I mean, I’m from NJ so I love bagels but this just takes it to a whole new level. LOVE it. Love that you put bagels in the strata. I shy away from stratas sometimes because the bread gets soggy, but I bet bagels hold up much better. Homemade bagels. YES. This strata looks wonderful! Total comfort food. This strata looks great. I love the broccoli and spinach combination in this egg dish. That looks absolutely delicious! Eggs, spinach and cheese are the best together. Is it wrong that I want to eat it right now instead of cannoli cake?! That’s serious.